This Pinterest inspired craft project only took 30 minutes to put together after I got all of the supplies! I came up with this idea after seeing a similar project on Pinterest, and altered it to fit my taste and my love for sentimental decor! 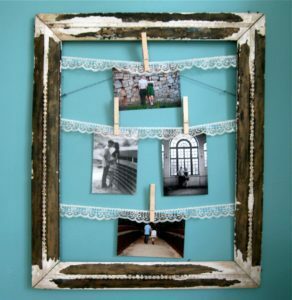 All you need for this project is an old frame, pictures, lace, ribbon, or string, a stapler or nails, and clothes pins. I have held onto this frame for years, unsure of what to do with it, and was excited when I finally came up with this project! Luckily the wood was soft enough (I picked it up from a trash pile outside of someones house on the brink of rotting) for me to attach the lace with staples, you may need to use short nails or thumbtacks. I made this to show off some of Nick and my engagement pictures, and I plan to add some wedding pictures. 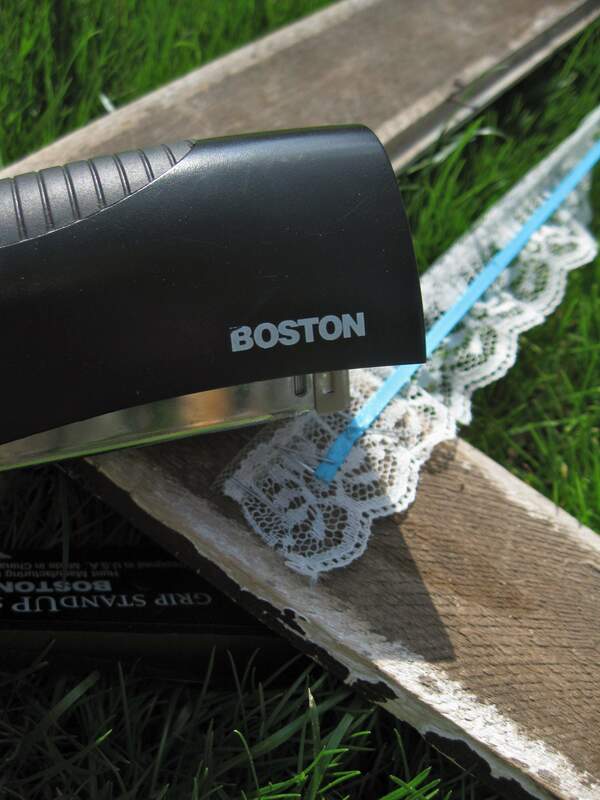 Because of the subject matter I decided to pick up the same lace my Mom used to make my garter belt, and thin blue ribbon to tie in our wedding colors. 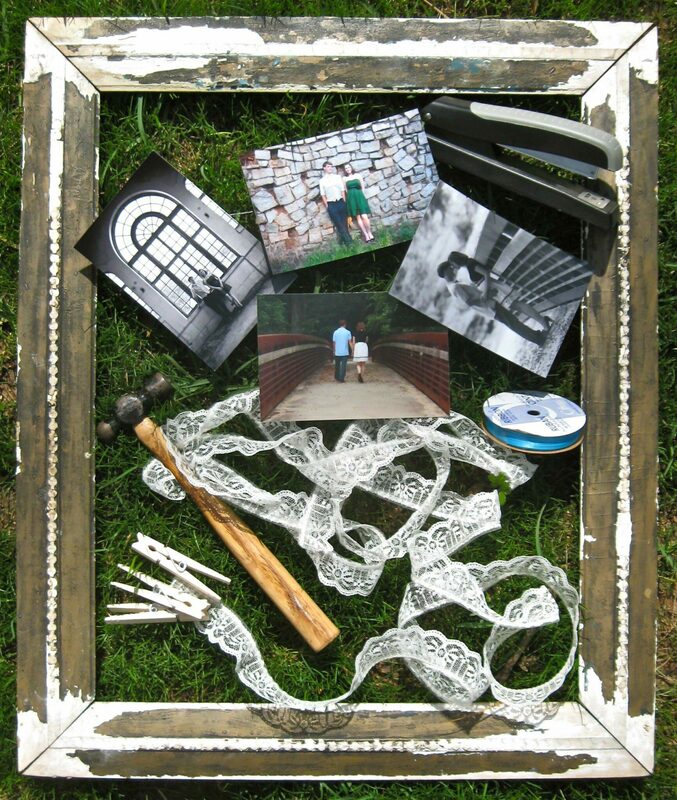 You could use lace, ribbon, string, or twine. Choose whatever is most appealing to you! I wanted the vertical pictures in the center, which are 7 inches long. 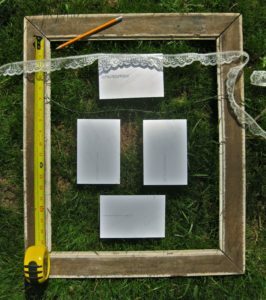 The entire length of the inside of the frame is 21 inches long, and to make sure they were centered I subtracted 7 from 21, then divided it in half: 7 inches. I measured 7 inches down from the top and marked it on both sides (this is important because you want to make sure the ribbon is level!). I did the same for the picture at the top, which is 4 inches long, I subtracted that from 7 (which is the length of the section it is in), and divided it in half to center it: 1 1/2 inches. Again, I measured 1 1/2 inches down, and marked it on both sides. 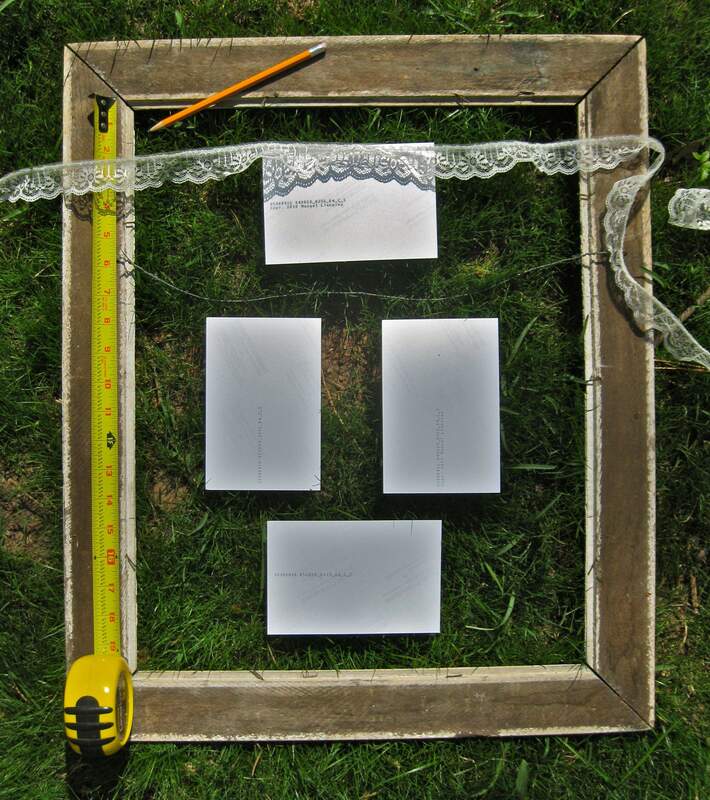 The bottom section has the same measurements as the top, but you want to measure down from the bottom of the center pictures, since the lace is placed at the top of the picture. After I carefully measured and marked I attached the lace and ribbon using a stapler. I wanted the blue to show through the lace, so I centered it on the back of the lace. After the ribbon was attached, I attached the pictures to the ribbon using clothes pins. 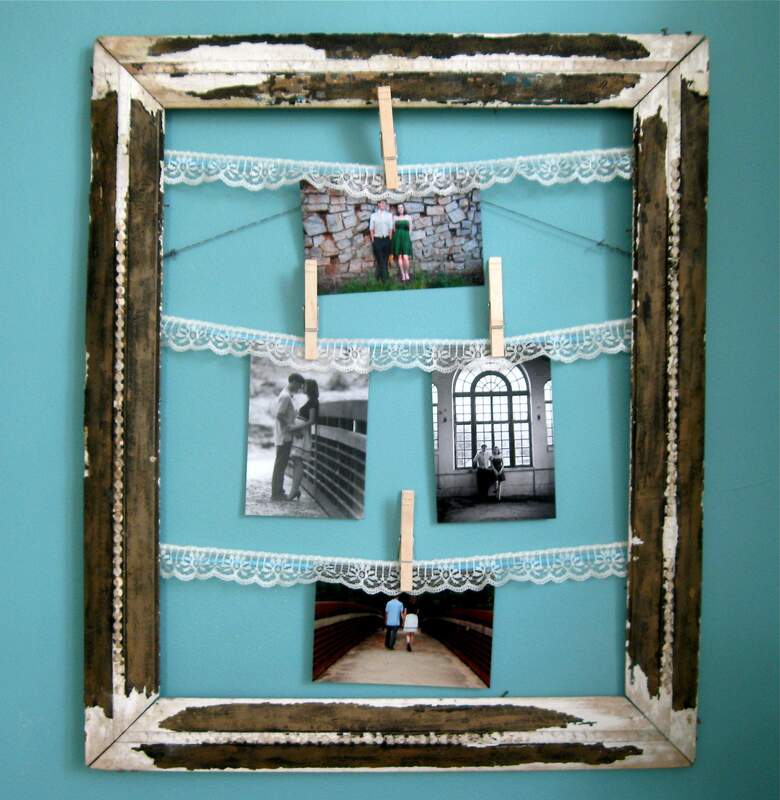 You can also play around with the clothes pin color by painting them! I tried the frame on a couple of different walls in my house until I settled on the neutral colored one. I love the brown frame against the blue wall, but the blue ribbon shows up best on the neutral one. 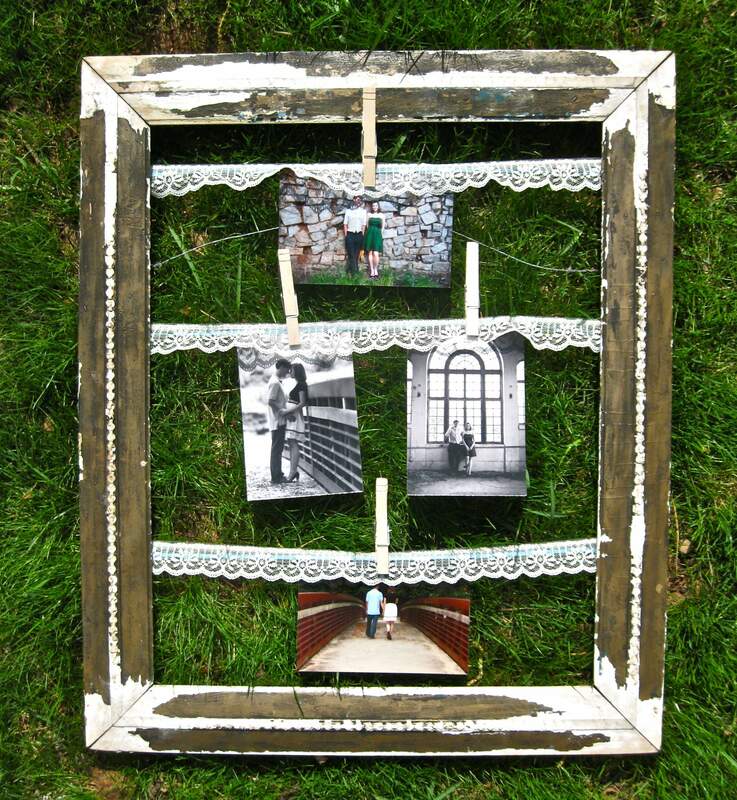 I love this project because you can personalize it to your taste and decor and it is so easy to make! Please comment, ask questions, give your opinion! 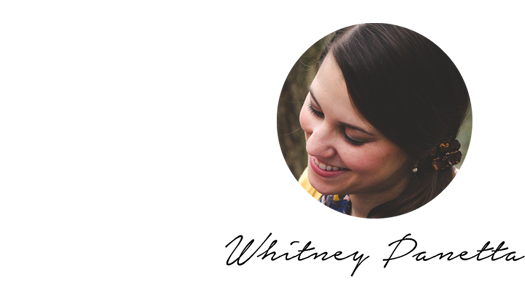 If you enjoy this post feel free to share, like, digg, stumble, help me spread the word! I selected this post to be featured on Craft Blogs. Please visit the site and vote for my blog!